A few weeks ago the boys chose to watch Harry Potter and the Sorcerer’s Stone for a family movie night. In it, the character Arthur Weasley (who has recently charmed the family car to make it fly) is delighted to meet young Harry Potter and almost immediately asks him to clarify, “What exactly is the function of a rubber duck?” The silly line always makes the boys giggle because, of course, rubber ducks don’t really have a function. Or so I thought. Then I saw a headline that caused me to revisit the question. 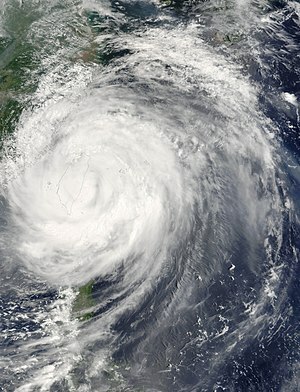 About a week ago a stunned crowd attending the Taoyuan Land Art Festival in Taoyuan County, northwestern Taiwan watched, heartbroken, as officials dragged to shore what is being called (on the infallibly accurate “Twitter”) the first victim of Taiwan’s recent 6.3-magnitude earthquake. The victim in question (as I’m sure you would expect) is a 59-foot tall yellow rubber ducky. Designed by Dutch artist Florentijn Hofman, the deflated ducky was one of several that have been touring the world’s waterways since 2007. The duck’s pumps lost power after the earthquake causing the sculpture to deflate. 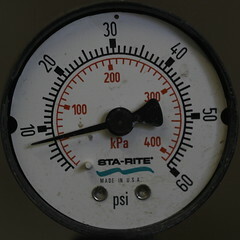 It burst during the process of re-inflation. This isn’t the first time that one of the ducks has been damaged. They have been knocked around and accidentally deflated a few times. While on display in Belgium, one was even stabbed by (remarkably angry) vandals a total of 42 times. Okay, eww. But I assume that what he means is that the rubber duck has become something of a worldwide symbol for childhood innocence. I can get behind that. The simple little (or not so little) bath toy is so ubiquitous that it has become difficult even to trace its origins. The rubber ducky simply is. Rumor has it that the first rubber ducks were produced in New York. Of course Akron, Ohio also makes a claim to the favorite of all bath toys and (as it is the “rubber capitol of the world,”) I might have to give it the benefit of the doubt. Either way, what’s fairly obvious is that the rubber duck industry rose alongside the rubber manufacturing industry itself. Around 1900, tire giants Goodyear and Firestone established plants in Akron (because, after all, it’s the capitol). Around the same time and for several decades after, rubber toy manufacturers also started popping up in Akron (again, the rubber capitol), producing all kinds of lovable characters, including the beloved rubber ducky. This is important to understand because of a recent announcement made in the city of Akron. You see, in addition to being the rubber capitol of the whole entire world, Akron is also host to the Double-A Cleveland Indians affiliate baseball team, long known as the Akron Aeros. But for next season and beyond, the Aeros will now be known as the Akron Rubber Ducks. So I get it. They could have chosen to call the team the Akron Monster Truck Tires (intimidating even to a 59-foot tall rubber duck, I would think) and I doubt anyone would have complained. But that probably would not have had as much draw for the lion share of their market, the young families who don’t yet have the money or the level of kiddo interest to invest in a trip to Cleveland just for a baseball game. And it turns out that Taoyuan officials may have had a similar motivation for recovering their duck as quickly as possible. 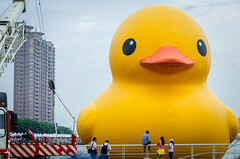 Their first call after the collapse of the floating sculpture was to the city of Kaohsiung to see if they could borrow the Hofman-designed duck on display there. The duck, which had been in Kaohsiung for about a month, had drawn 4 million visitors (and their money) to the city, during a typhoon! So to my sons and to Mr. Weasley I guess I have to admit that a rubber duck really doesn’t have much of a function, unless of course it’s 59-feet tall and charmed to fly. I’d probably pay to see that. Just don’t fly it too close to Belgium. Did you hear? The rubber ducky was inducted into the Toy Hall of Fame today! I saw that there was an effort to get it inducted, but I had no idea that it had happened. Or that it happened today! That’s so great! I miss the old rubber ducky and old tub with feet. It seems to be from a time that is lost. 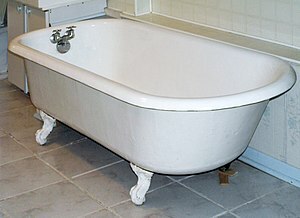 I am currently renting my 4th house and non of them has had a tub. Sending my daughter into a claustrophobic shower cabinet with a rubber duck isn’t quite the same. It makes me think that modern life has given us a lot, but I think we have lost quite a bit too, such as time. We’ve never had less of it. Everything today is very fast and no one can spare poor ducky some time. I guess it’ll be forgotten because as you say, it has no function anymore. Very interesting blog, bye the way! Thanks! I think maybe you are voicing exactly what the artist was trying to address with his sculpture. It’s good to look back to the whimsy of childhood and simpler days sometimes. Maybe it isn’t just a duck, after all.